Bellator Fighting Championships will be taking their talents to Harrah’s Tunica Hotel and Casino in Tunica Resorts, Mississippi. 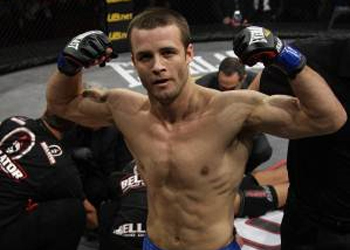 “Bellator 73” takes place August 24th and features a featherweight title tilt between champ Pat Curran (Pictured) and Patricio “Pitbull” Freire. The finals of the promotion’s Summer Series Light Heavyweight Tournament, as well as the Bantamweight Tournament Finals with Marcos Galvao and Luis Nogueira will be showcased in the event. Pitbull has been riding the pine for over a year after suffering a broken hand. He solidified his top contender status by running through Bellator’s Season 4 Featherweight Tournament. MTV2 will broadcast the main card at 8PM ET/PT.